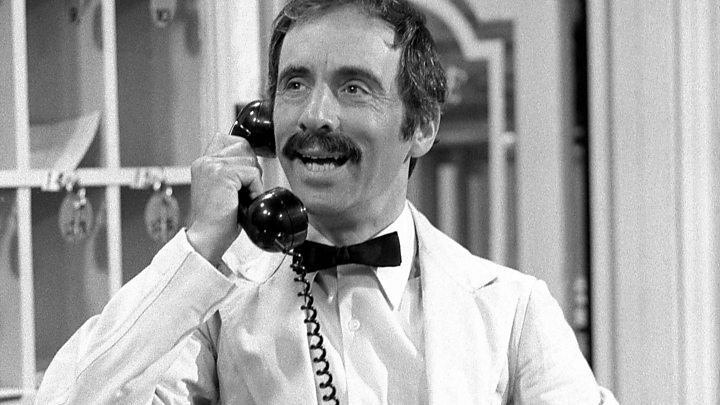 Fawlty Towers star Andrew Sachs, who played hapless Spanish waiter Manuel in the BBC sitcom, has died aged 86, his family has confirmed. Sachs, who had been suffering from dementia for four years, died on 23 November and was buried on Thursday. On his role of Manuel, he told the BBC in 2014: "It was just a part I was playing and people seemed to laugh." Fawlty Towers star John Cleese called Sachs "a delight", while show co-writer Connie Booth said Manuel was "iconic". The BBC changed its schedule on Friday to broadcast the Fawlty Towers episode Communication Problems, featuring Manuel's famous "I know nothing" line. Manuel was one of the most imitated comedy characters of the 1970s. The waiter, who famously hailed from Barcelona, often said little more than the word "Que?" to generate laughs, but arguably his most famous line was "I know nothing". 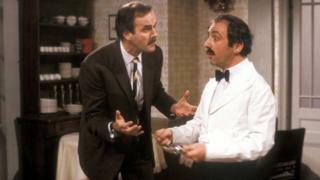 The waiter was regularly shown being hit by Cleese's hotel manager character, Basil Fawlty. "I never got upset when he hit me," Sachs said in 2014. "He's my friend, I must say yes, yes [it hurt], several times, more than once." Cleese, 77, who was also the co-creator of Fawlty Towers, paid tribute to Sachs in an interview with the BBC. He described his co-star as "a very nice, sweet man and just a brilliant farceur". Cleese added: "He was just a delight, and if you met him, you'd never for a moment think he was a comedian. "You'd think he was a bank manager, possibly retired. But then you stuck that moustache on him and he turned into a completely different human being." Fawlty Towers co-writer Booth, who played hotel maid Polly Sherman in the series, said Sachs "spoke to the world with his body as well as his mangled English." She said he was a "universally beloved figure", saying it was "a privilege and an education to work with him". Writing in the Guardian, she also compared the pairing of Cleese and Sachs to that of Abbott and Costello or Laurel and Hardy. She wrote: "People say that nobody but John could have played Basil; it's just as true that nobody but Andrew could have played Manuel." Booth added: "The character became iconic." Sachs, who was born in Berlin in 1930 but fled Germany for London in 1938, had dozens of other acting roles, both serious and comic - including stints in TV's two biggest soaps. In 2009, he played the role of Ramsey Clegg, half-brother of Norris Cole, in ITV's Coronation Street and in 2015 he briefly joined the BBC's EastEnders as Cyril Bishop. He inadvertently became the subject of headlines in 2008 when he received a series of lewd answerphone messages from Russell Brand and fellow BBC Radio 2 presenter Jonathan Ross during a radio show, which related to Sachs's granddaughter. The so-called Sachsgate affair resulted in Brand and the controller of Radio 2 resigning. Ross was suspended from broadcasting for three months and a review was held into the way BBC output was vetted. Sachs's friend, Blackadder actor Tony Robinson, told BBC Radio 5 Live that Sachs had been "very modest" and said that "it really came as a surprise to him that he had the success that he did". "People know him for that one comedy performance, but he was actually a magnificently talented man in a number of fields," he said, adding that Sachs had been "a very fine photographer" and "a very accomplished playwright". He said: "He's worked in radio for very many years and in a way, given how shy and retiring he was, it was a good form for him. "His face wasn't shown, he could work a lot but he didn't have to be a celebrity - and then suddenly he was thrown into the limelight." Comedian Omid Djalili tweeted: "Sad to learn of the passing of Andrew Sachs. Fond memories sharing a dressing room with him & Bill Bailey at We Are Most Amused in 2008." Samuel West, whose mother Prunella Scales starred alongside Sachs in Fawlty Towers, tweeted: "Creator of one of our most beloved EU migrants. "Such warmth and wit; impossible to think of him without smiling." Little Britain creator David Walliams described his performances as Manuel as "comic perfection". He tweeted: "I had the pleasure of working with #AndrewSachs in 'Attachments'. A beautiful soul who never tired of all my 'Fawlty Towers' questions." Comedy writer and director Edgar Wright said Sachs had "spun comic gold as Manuel in Fawlty Towers". Actor Eddie Marsan, who starred in the BBC's Jonathan Strange & Mr Norrell, tweeted: "RIP Andrew Sachs. You came here as a refugee with nothing but your talent and your spirit, and you enriched our lives. Thank you so much." 'Allo 'Allo actress Vicki Michelle said: "So sorry to hear of #AndrewSachs passing. Happy memories of working with him, a lovely gentle man. Thoughts are with his family." BBC Radio 2 DJ Tony Blackburn also joined the tributes, tweeting: "So sad that Andrew Sachs has passed away... He gave us all so many laughs on Fawlty Towers, thank you. R.I.P." Actor Mark Gatiss wrote: "Had the great pleasure to work with the sweet and gentle Andrew Sachs on [writer] Bert Coules's Further Adventures. His Manuel is imperishable." Charlotte Moore, the BBC's director of content described Sachs as a "wonderful actor". "He will be fondly remembered for his many appearances across television and radio, not least for making the nation laugh in the classic role of Manuel. He entertained millions across a brilliant career and will be greatly missed."